Do you love Halloween treats? 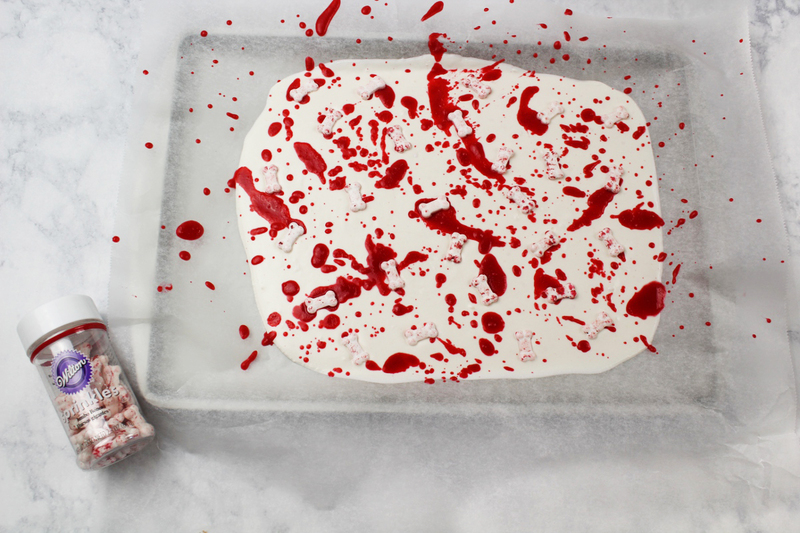 If you said yes, then you must make this Bloody Delicious Halloween Bark! Memories of my childhood flood back to me as I watch my children’s excitement. I can remember all the costumes my mom made by hand for us, including the weird frog costume she made for my brother. Maybe I will dig it up, yes she still has it, and show you one day. I too have made my girls costumes over the years when required, it is so fun! Sometimes I wonder if some adults forget about their childhood when I read posts in mom groups about “do you know how much sugar is in Halloween candy”. Or when someone came up with the switch witch. Don’t get me wrong, you are entitled to raise your children however you see fit, just remember that a little candy isn’t going to kill them … well, unless they are allergic to it, but that is a different situation. Everything in moderation is my motto! So, yes I allow my children to eat their Halloween candy … all of the stuff they like and whatever I don’t steal. We have a house rule, they are allowed 1 chip, 1 chocolate, and 1 candy per day. They can choose to take those treats (peanut free) to school or have them when they come home. If you need a costume for the kids (or you), Amazon has a pretty stellar selection and they ship extremely fast. I will find any excuse to make sweet treats for my kids. Oh, it is national xyz day? 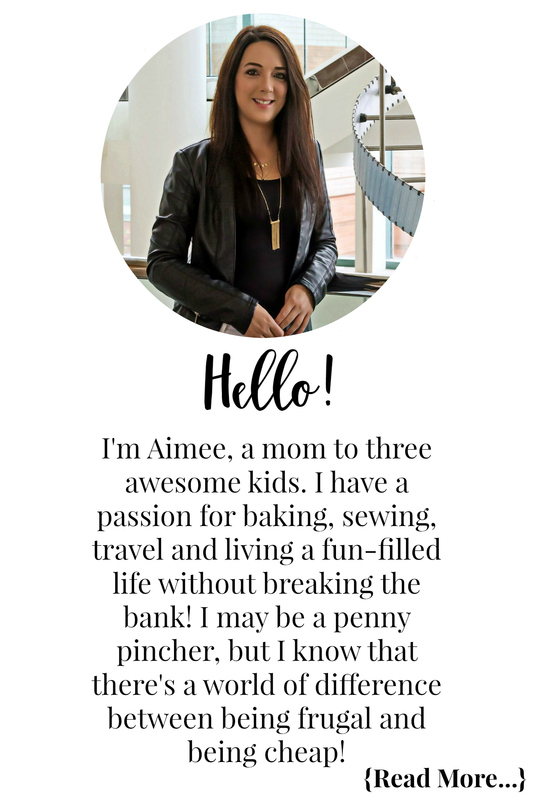 Cool, let’s bake something to celebrate! 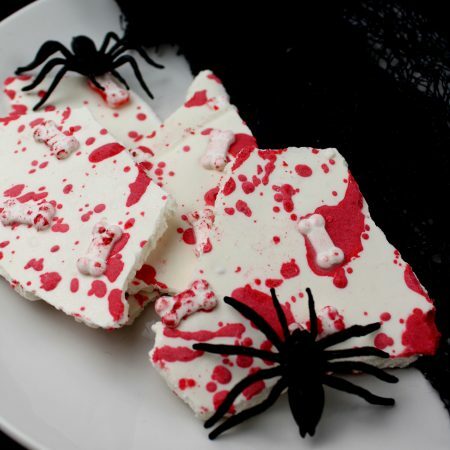 Halloween is no exception folks and this bloody delicious bones Halloween bark is the perfect treat. Not only is it super easy to make, if you host a Halloween party this freaky treat is sure to be a star on the dessert table. 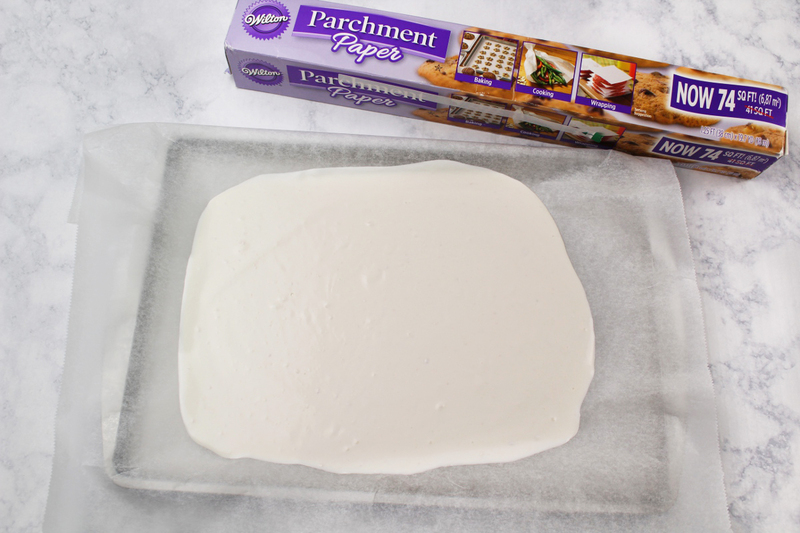 Line a pan with parchment paper. Melt white chocolate then pour onto pan. 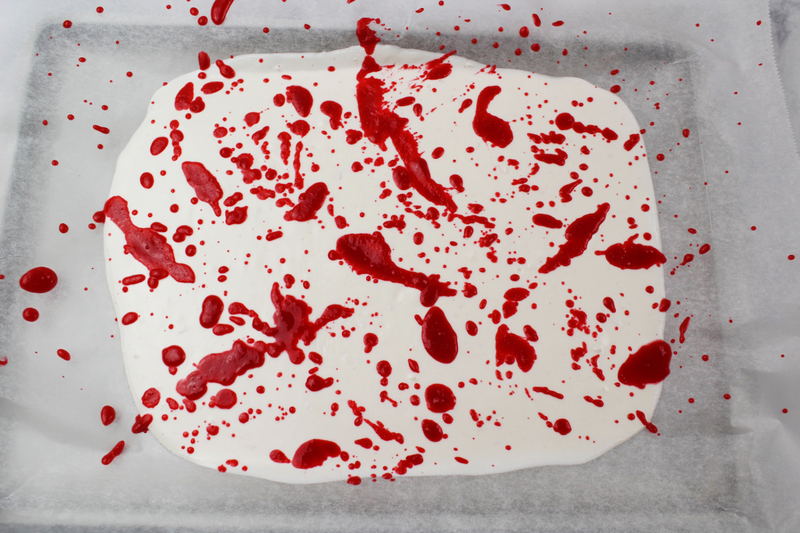 Splatter red chocolate onto your hardened white layer. While the splattered chocolate is still wet add on your bone sprinkles. Let it set and then break it into pieces to serve! This spooky Halloween bark recipe is perfect to serve up to your guests at your Halloween party, or maybe just a tasty treat to make with the kids! Melt the white Candy Melts or chocolate in the microwave in 15 second intervals until smooth and free of lumps. Cover a cookie sheet with parchment paper. Pour the melted white chocolate onto the parchment paper and spread with a spoon. Allow it to dry completely before moving on to the next step. 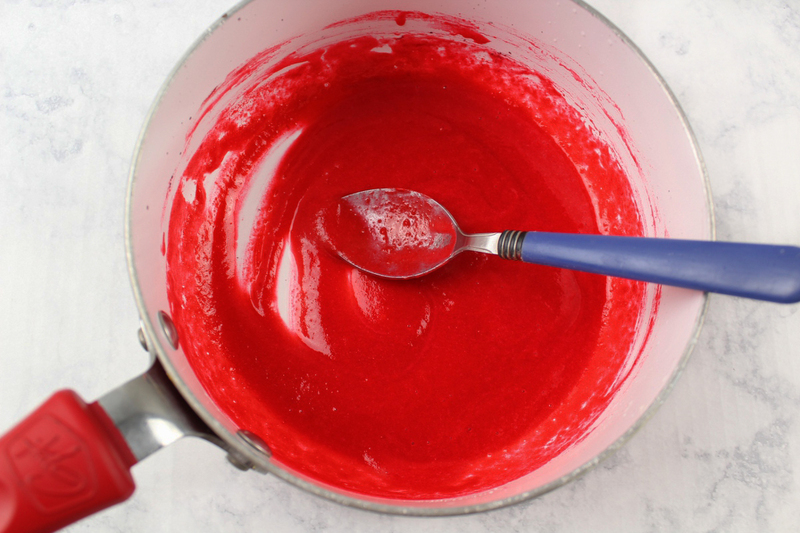 Melt your red Candy Melts in the microwave in 15 second intervals until smooth and free of lunps. Dip a spoon into the melted red Candy Melts and fling it onto the white bark. Keep doing this until you’ve reached your desired look. While the splatter is still wet, add your bloody bone sprinkles. 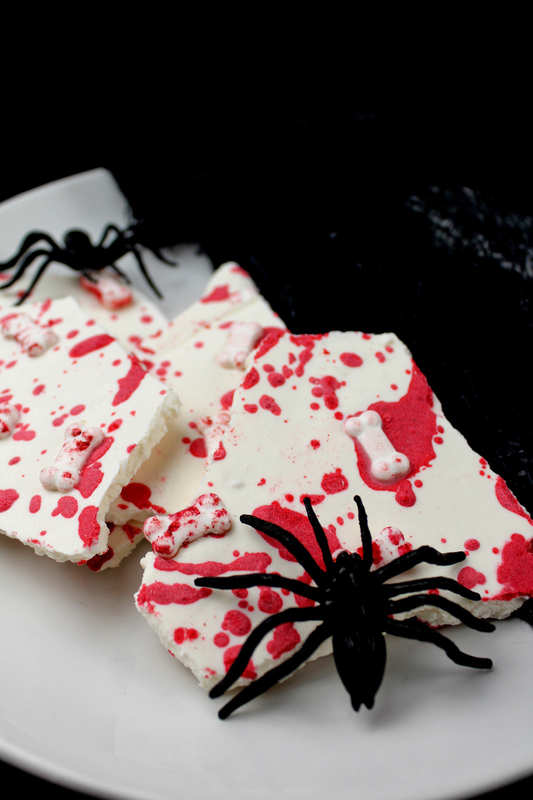 If you are unable to find these sprinkles, any spooky bone sprinkles would look perfect! Check out these other great Halloween recipes and crafts! I too have a similar Halloween candy rule as you do. 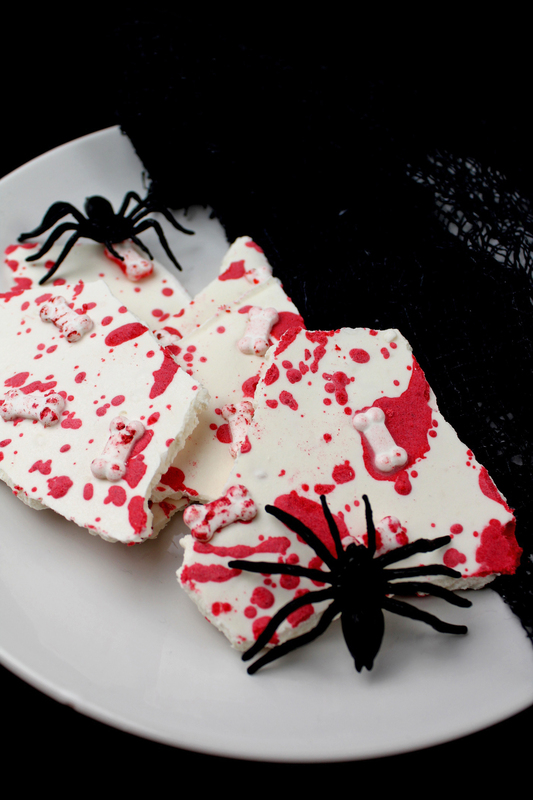 And the “blood splatter” design on the Halloween bark is spot on! I only ever make (peppermint) chocolate bark for Christmas but I absolutely love this idea too! My favourite childhood Halloween memory has to be our first trick-or-treat outing! It was so exciting for my sister and me.